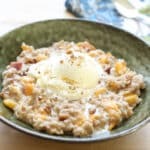 I’ve been making peaches and cream oatmeal all summer long; filled with soft pecans and sweet peaches, this is a memorable breakfast. 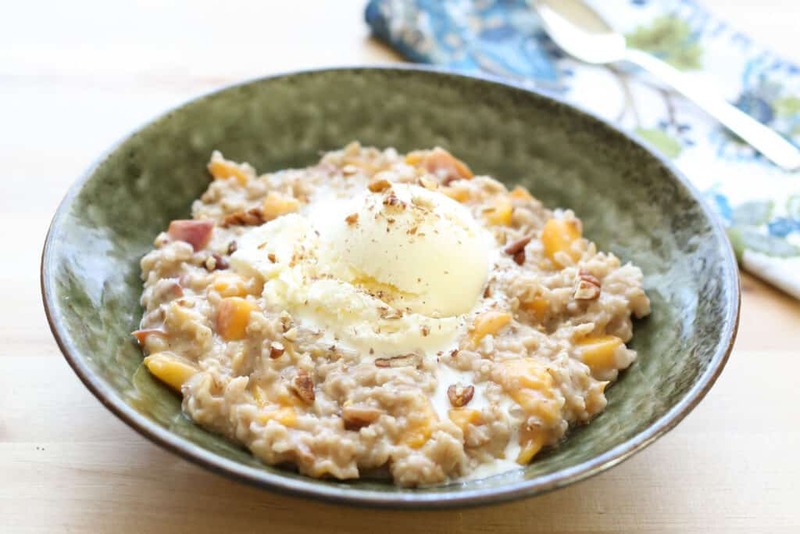 (I save a couple peaches to make this oatmeal almost every time I buy fresh peaches.) If you dare to top your oatmeal with a scoop of vanilla bean ice cream, this really might be the best oatmeal you’ll ever eat. We aren’t new to the ice cream and oatmeal combination. If you haven’t tried ice cream with your oatmeal yet, you are missing out on some serious awesomeness for your breakfast! While it sounds crazy at first, I figure that a small scoop of ice cream has to be comparable to a spoonful of sugar and a splash of milk, right? If I’m wrong, don’t tell me, okay? The first time I made this oatmeal was over a year ago. My kids had spied the peaches on the counter and they begged me to put the fruit in their oatmeal. Even knowing that I had planned to make more jam wasn’t enough to change their minds. I’ll give them credit though; the oatmeal was a great choice. We have a well-known history with oatmeal in this house. Made in the oven, on the stove or even in the crock-pot, we definitely love our oatmeal! Not a fan of oats? I bet one of these oatmeal recipes just might change your mind! Kitchen Tip: I use this saucepan to make this recipe. 2 large peaches chopped small, about 1/2"
Combine all ingredients, except the toppings, in a medium size saucepan. Bring to a boil and immediately reduce to a simmer. Simmer for about 5 minutes, stirring frequently. When the oats are tender, remove from the heat. Portion into serving bowls and add the toppings of your choice. Enjoy! How delicious. I'm not that crazy about oatmeal, but if they're made creamy and with nice add-ons like peaches and nuts... I'd eat it every single day. Thanks for your lovely recipe. I love a good bowl of oatmeal and peaches would be a delightful addition. I know I would squeal with delight if my son asked for peaches in his oatmeal-getting him to eat fruit is my food challenge with him. There is nothing like fresh peaches! This sounds soo good, I wish I had some peaches here for oatmeal in the AM. We just love oatmeal in this house - add peaches and nuts - what could be better to start the day. This looks like a delicious bowl of oatmeal! It's hard to beat fresh peaches. I love the idea of adding ice cream to oatmeal - my kids would be thrilled! This looks like an incredible breakfast! That's quite odd that you found it lacking in flavor. It is oatmeal, so there should be plenty of oat flavor. However, with peaches, nuts, a splash of cream, and whichever toppings you like best, it should've been full of flavor. The only thing I can think of would be if you used peaches that were lacking in flavor. 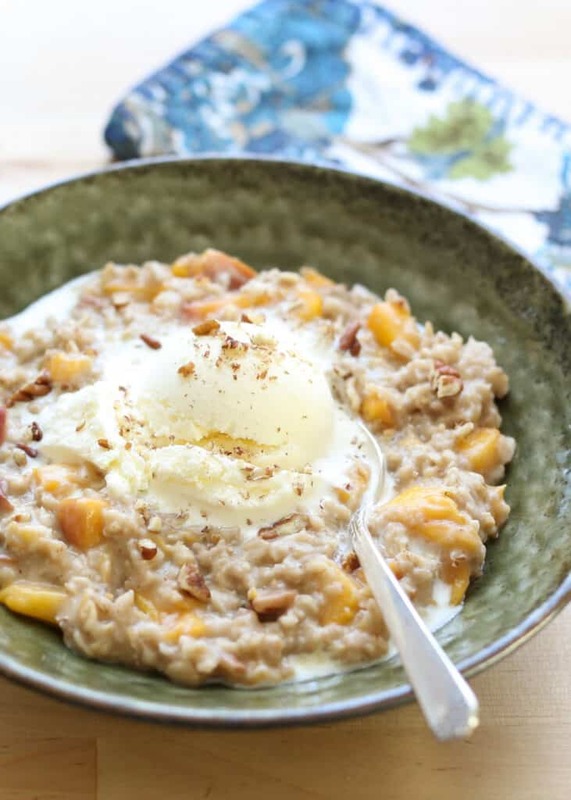 We love this oatmeal and make it many times a year whenever peaches are in season.